Innovative design. Using PROE, finite element analysis, simulation and simulation analysis and other high-tech software optimization design, the maximum use of material mechanical properties, light weight and higher mobility. A strong, reliable main arm. The five large section U type main arm has a full outrigger length of 49m and a full extension of the main arm and 67m. The maximum lifting torque is 3658kN.m, and the lifting capacity is strong. Using double cylinder rope arrangement expansion mechanism, high efficiency and reliability. A super long, practical arm. It is equipped with auxiliary arm extension cylinder to facilitate the installation of the jib. The jib can be lifted at 0 degrees, 20 degrees, and 40 degrees elevation. Stable and reliable structural parts. Double wall plate box type turntable, greatly increasing rigidity. The span of ultra large leg is effective to improve the stability. Accurate and efficient electro-hydraulic system. The load sensitive variable displacement piston pump is matched with the electric proportional control main valve and adaptively regulates the displacement of the oil pump. The full color display, the power distribution proportional control handle, the human-machine interaction is more comfortable. It is easy to operate, practical and convenient. Brake system: independent front and rear axle circuit brake, four wheels are equipped with disc brake, safe and stable. Maximum climbing capacity: 81% (theoretical calculation). Complete and humanized functions. The balance weight can be disassembled and assembled by itself to facilitate transportation. It is equipped with remote control handle to realize remote control and easy to observe. The control room can be tilted to enhance the comfort of high angle work. 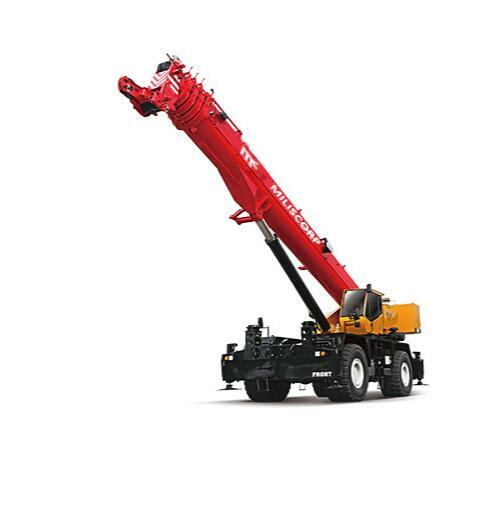 Looking for ideal Xcmg Rough Terrain Crane Manufacturer & supplier ? We have a wide selection at great prices to help you get creative. All the All Terrain Crane are quality guaranteed. We are China Origin Factory of Rough Terrain Crane 35t. If you have any question, please feel free to contact us.